I have been trying to understand the meaning of the question from the posted image. I think that preloading has to do with adding bolts to the cantilever beam such that it can withstand the force from above, but I am not sure how exactly these bolts should be implemented. I would also like to generate a meaningful equation based on the information provided. Edited by LandCacci, 01 January 2019 - 10:15 AM. I'm not an engineer but I should have thought that preloading might be applying a stress to a load-bearing structure so that it deforms less when subjected to the loads it is designed to carry in service. A sort taking up of the "slack", if you like. But I see you've splashed this enquiry all over the internet so no doubt an engineer somewhere will give you a reply. When you get the authoritative answer, I'd be interested to know what it is. Edited by exchemist, 01 January 2019 - 11:39 AM. Consider that the top portion of a beam will be in tension, and the bottom of the beam would be in compression. Adding a compressive load at or near the top of the beam will add strength and reduce deformation, and likewise, by adding a tensile load to the bottom. Not an engineer, but I did have some classes. I assume that you mean that the top portion will produce a reactionary tensile shear force pointing in the positive x-direction. I also assume that the bottom portion will produce a reactionary compressive shear force pointing in the negative x-direction. Would nailing the beam to the wall be the best way to counteract these shear forces (shear flow)? The nails themselves only hold the beam in place, they do not make the beam itself stronger,. A quick internet search of "pre - stressed beams" should yield you more detailed information than I can provide. Being a farmer and not an engineer, my engineering expertise is of the improvisational kind. 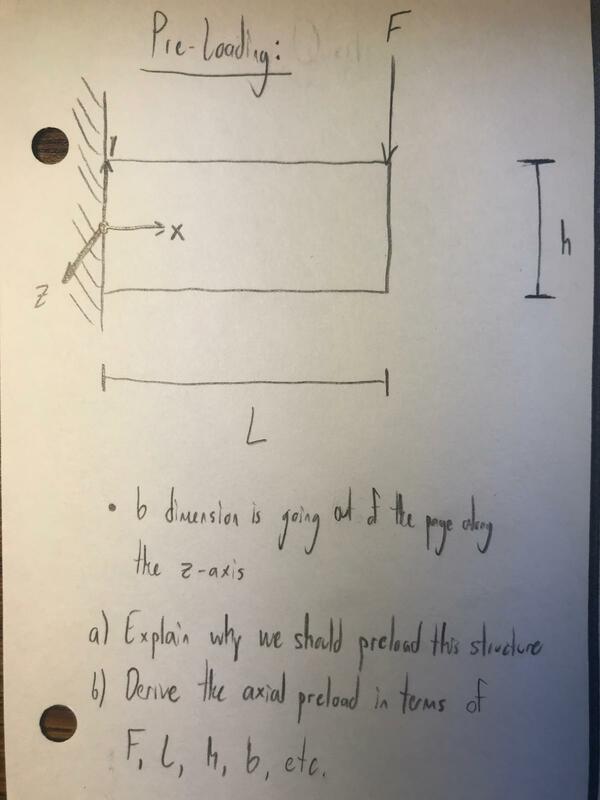 Were I wishing to strengthen a beam, I would use threaded rods over the length of the beam for applying tension and compression, but I don't know if that solution would be in any text books. I left my engineering education incomplete to return to the farm, so I missed out on some of the details. Another way to look at it is the top of the beam is being pulled and the bottom being pushed in. If my memory serves me correctly, the force in the center of the beam would be zero. If you are good with calculus you can come up with an equation that would give you the force at all points in the beam based on that information. I also seem to recall that the load distribution curve over the length of a cantilever beam is parabolic. If that is any help.